Want to shop podiums by color and finish, rather than by style, design, or material? Podiums, lecterns, and reading stands are not only accessories for speakers, ministry, lectures, and teachers. They are also furniture pieces that need to complement or coordinate with their environment for maximum effect. This is especially important for portable or mobile podiums that are used in different locations within an office, commercial, or professional facility or at multiple trade shows and off-site events. The ability to shop podiums by color can be helpful to many businesses when they decide to purchase speaking furniture. Whether the goal is to focus audience attention through a design that contrasts with existing style or to balance and complement decor, browsing our podiums for sale by color can help businesses and facilities decide which speakers stand or reading pulpit is the best purchase for their needs. What materials and finish color options are available for these podiums for sale? Neutral Finish Podiums: A full range of neutral shades are available as finishes and veneers for real and engineered woods, as colors for plastics, and as painted overlays on wood and metal furniture. MDF (medium density fiberboard) features a thin coat of color applied directly to the substrate for a hard-wearing finish. Colored ABS plastic provides lightweight, waterproof construction that is popular for portable or outdoor-rated speaking fixtures. Powder-coating creates a durable, scratch resistant finish and is used on a variety of different metals, including steel and aluminum. BLACK finish lecterns are frequently seen as the focal point of a room. These boldly colored fixtures are ideal for use in facilities where multiple presenters use the same stand. Depending on the surrounding decor, black lecterns can blend or stand out as desired. WHITE finish speaking stands and presentation furniture are designed to present a clean, modern look that focuses attention on the speaker and surroundings. These neutral finish fixtures frequently serve as a base for brightly colored custom graphics that allow businesses and facilities to attract attention to messaging and branding in crowded public environments. Transparent podiums are offered in SMOKED, FROSTED, or CLEAR ACRYLIC stands, sometimes as combinations of different materials and finish colors. Mimicing the look of glass with completely see-through or faux frosting, these lightweight plastic designs bring a modern, contemporary look to any environment. Dark, smoked finish plastics add depth and the impression of weight to lecterns and laptop stands. In addition, many speaking fixture styles combine acrylic with metal for a modern look with classic details that provide balance. Metallic Finish Podiums: Depending on the specific metal, finishes can be applied by plating or painting processes. The most durable finishes are sprayed-on powder coats which provide hard, scratch-resistant surfaces that are ideal for withstanding heavy daily use. Metallic finishes also offer increased brightness, shine, and texture that can help lighten the feel of any environment, as well as adding a modern, clean look to existing decor. SILVER finish creates a modern, industrial look on metal podiums, such as our truss-style aluminum and steel speaking stands. This neutral color is also frequently used as trim or base supports and combined with different materials to give contemporary pulpits a classic look. Silver is generally applied as a smooth, satin finish but is in some cases offered in a textured brush finish. CHROME finish is created using a plating process and is usually applied to steel fixtures. This brilliant coloring offers increased brightness and shine over standard silver finishes. Wood Finish Podiums: Wooden finish colors and veneers are offered in a full range of shades from the lightest maple to the darkest mahogany. Stained finishes are painted directly on the furniture, whereas laminates are manmade polymers applied in thin layers or sheets, and veneers consist of a thin layer of natural material permanently bonded to the fixture. The benefit of using laminate or veneer is that it allows less expensive materials such as plywood, engineered woods, or less expensive natural woods to be used for the actual construction of the piece, rather than more expensive hardwoods or exotics. 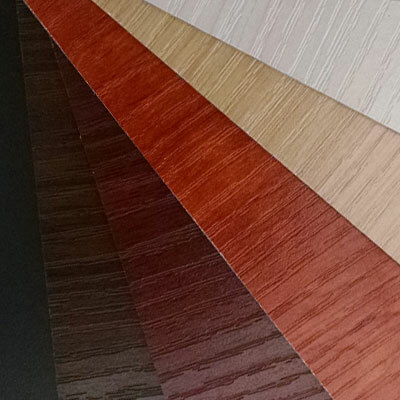 In addition, laminate finishes offer additional protection to the underlaying surface and provide increased resistance to water, staining, and even scratching or other damage. MAPLE finish fixtures give an impression of lightness that can help brighten a room. In addition, this light-colored wood can give a modern look to furniture designs without changing the overall feel of a room. OAK finish offers more depth than maple, and brings an increased sense of weight. Even when applied to modern constructions, this natural shade can help impart a sense of tradition. This type of neutral wooden color is very effective in corporate environments, as the natural wood gives the audience a sense of security and solidity. WALNUT finish offers increased depth and warmth, giving fixtures a traditional, classic feel that can complement heavier designs. Alternatively, modern constructions frequently use a walnut finish to allow contemporary designs to balance and blend with a variety of decor styles. CHERRY finish has a bright, bold feel that attracts the eye of audience members. The underlying red tones help give listeners and audience members a sense of belonging. This type of finish is a great choice for high impact fixtures designed for public speaking. MAHOGANY finish is offered in a range of shades, all of which offer deep, rich color that imparts a sense of depth as well as a traditional feel. Modern styles and designs frequently incorporate this elegant deep color with red undertones to anchor fixtures within a decor scheme. The heaviness of the coloration serves to provide a calming and secure element in any location, as well as imparting a sense of tradition and stability. Color has long been proven to have significant psychological impact. In the case of speaking furniture, which by intention becomes the focal point for customer and patron attention, this is an important element to take into account when purchasing a lectern, presentation or hostess stand. In addition to a wide array of fixture finish colors, Podiums2go offers a large selection of customized graphics and custom printing options. Customization options include full-coverage printed iPad stands, stock religious symbols imprinted on acrylic pulpit stands, and full-color custom graphics in a range of sizes. Depending on the model, images, logos, and messaging can be printed directly on body of the lectern, on separate panels that are attached with elegant metal standoffs, or simply inserted into frames attached to the fixture.